Throwback Thursday. Freshman Year in 2005. Pitching with a helmet on. Why? Because…. When you love the game, you’ll do ANYTHING to be able to play. My freshman year, I had an injury at the end of the season. On May 9, the day before our team was to leave to go drive to Big 12 Tournament, I got hit in the head with a line drive at practice. I was playing first base (when I didn’t pitch, I always played 1B). 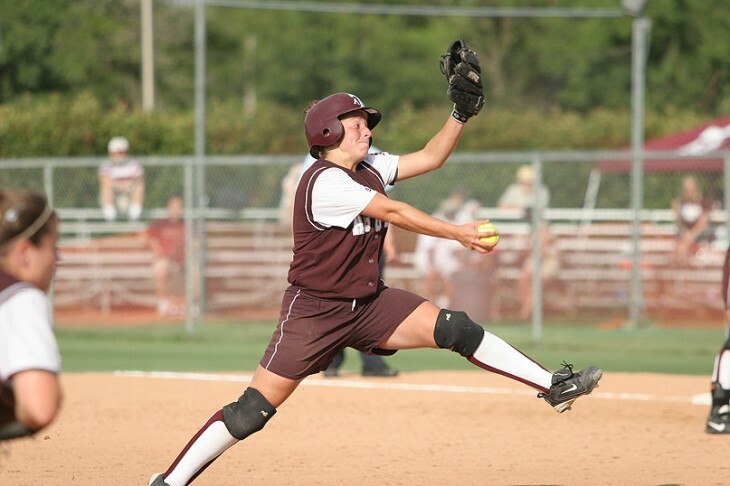 At practice, our pitchers would always throw live to our hitters to give them at bats. But like I said, I wasn’t pitching, I was playing in the field and a left handed hitter was up to bat with a runner at 1B. Because it was a bunt situation, I was expecting bunt, but instead, I had a line drive hit at me from an upperclassman who pulled the ball down the line. This ball was crushed. I had no time to react and get my glove up to protect myself. It didn’t hit any part of my glove, it hit me on the side of my head. They allowed me to go back to the dorm room for the night, but when me and my fellow freshmen classmates were at the dorm room, I couldn’t eat anything without throwing it up, not even tylenol would stay down, which is the sign of a concussion. That night, I went to the Emergency Room..and from there it’s all a little blurry of what happened when. Somewhere along the way I got a CT Scan where they found that my brain was bleeding a little where I got hit, and I had a small fracture in my skull. I stayed in the hospital over night, and the next day, May 10, the team left to go to Oklahoma City without me. I was so bummed, I wanted to go so bad. The Big 12 Tournament signified the official started of the post season in our minds. On top of that, the Big 12 Tournament was played at Hall of Fame Stadium, where the WCWS is played. May 10 is also my birthday. Double bummer to be stuck in a hospital. When the team got to Oklahoma City, they didn’t start games the first day, they attended the Big 12 Banquet. A banquet where all of the teams attend, and they announce the Big 12 Awards (Player of the Year, First Team, Second Team, Academic Awards, etc). On that day, after the banquet, I remember laying in the hospital bed, and I got a call from Coach Evans. She wanted to let me know that at the Big 12 Banquet I had been named Big 12 Freshman of the Year and Big 12 Player of the Year. I was the only person in Big 12 history to achieve this. After about a day, they were able to release me from the hospital because I was actually able to keep food down. I went home with my parents while my team was in Oklahoma City, as no one really wanted me to do anything. I didn’t understand. Yes my brain was bleeding, but all I wanted to do was be with my teammates at the field! Why couldn’t I go? I remember being at my parent’s house in Magnolia and listening to my teammates on the radio broadcast in our computer room play Oklahoma State (I think it was). It was SO WEIRD to listen to them on the radio without me being there. BUT…I talked my parents into driving me to Oklahoma City if we won that game. Well…..we won! So guess what…we drove to Oklahoma City!!! I remember being so happy to get to be with the team. Our semi final game against Baylor was on Fox Sports, and since I couldn’t play, they invited me into the broadcast booth for a half inning. Maybe you could call this my big break into TV?! We ended up losing that game and I drove home with my parents while my teammates rode home on the bus to start practicing for the post season, as NCAA Regionals would be that next week. 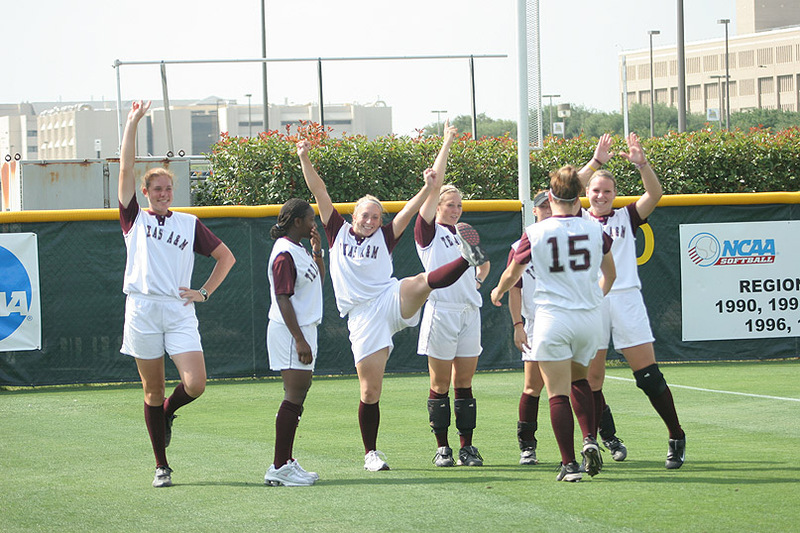 We hosted Regionals in College Station, as that year we were at Top 8 National Seed. I did not get to play…apparently this whole brain bleeding and fractured skull thing was a big deal. Who knew!! 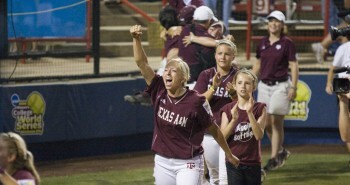 We won that Regional, and the next week we were to face Alabama in Super Regionals, hosting them in College Station. What we called “Club 190.” In between innings, the players who were not playing out in the field would run down to left field to keep legs fresh. It was always a time where we had fun, stayed loose and made some smiles. You see Sharonda McDonald and I in tennis shoes. We were both injured and unable to play. The week going into Super Regionals, it had been about 2 weeks since I had gotten hit, and the doctors, trainers and my parents said I could play in Super Regionals BUT I would have to wear a mask when I hit, and if I pitched, I would have to pitch withs something protecting my head. Me, Jamie Hinshaw, Jami Lobpries and our trainer, Leah, made a trip to Academy to figure out something I could put over my head. We tried soccer headgear, wrestling headgear, and none of it was satisfactory. I couldn’t pitch if we didn’t figure something out. So…..we decided I would have to pitch with a batting helmet on if I wanted to play. In order to get a little breeze, they cut a whole in the back of the helmet where my hair bun could go through, and a little air could circulate through. I practiced 1 or 2 days before Super Regionals started, and Coach Evans wanted me to throw to some hitters with the helmet on to see if I could do it and how it felt– a trial run for what was to come in the actual game. 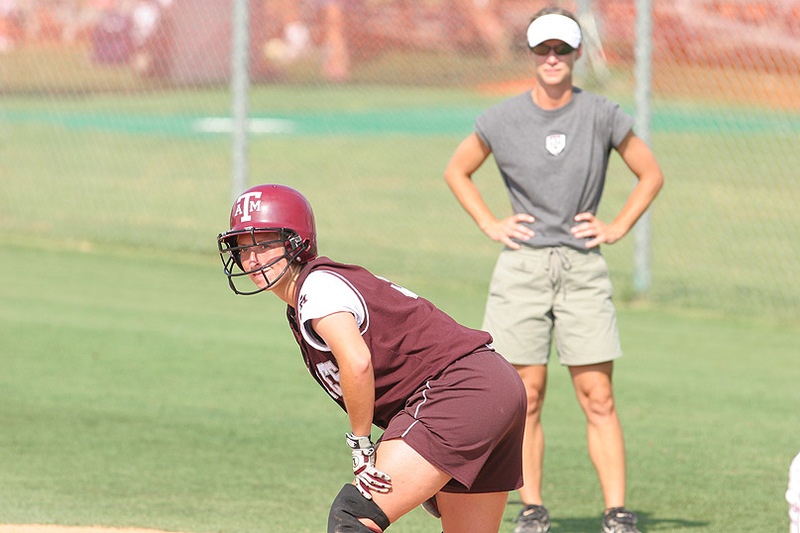 The first hitter I pitched to was Jamie Hinshaw, a fellow freshman teammate, left handed hitter. She came up and in her first at bat against me at practice, ironically, I hit her in the head! We laughed about it and one of the local reporters was there, and he ended up writing about it. Good times. Super Regionals started as Pat Murphy and Alabama came in to College Station. We lost the 1st game of the Super regional, I pitched the second game of the series the following day. It was May in Texas and it was SO HOT. In between innings for my warm up pitches, I wouldn’t pitch with the helmet on, I would leave it off in the circle, and then I would put it on when it came game time. Yes, it was a little embarrassing, but I just wanted to play, and I would have done anything to play because I loved it. I’ve never seen anyone do this before…maybe no one has had to. 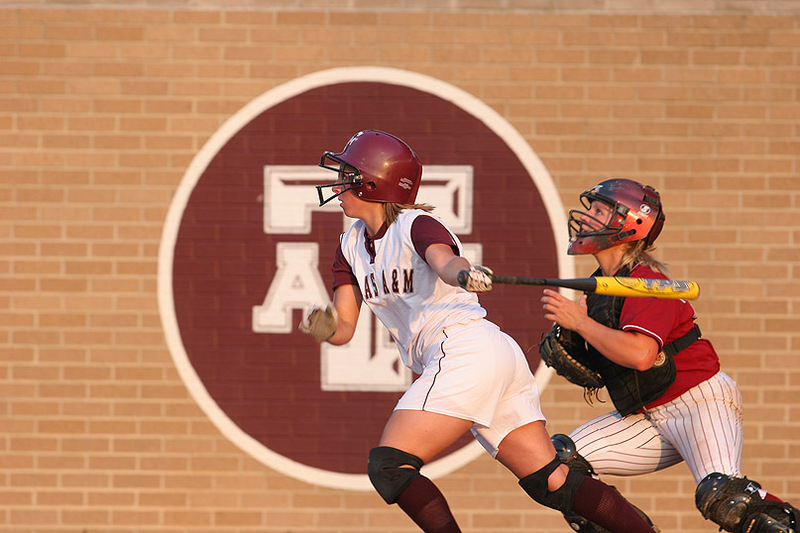 But we had to be creative, even if it meant pitching with a BATTING HELMET on my head against University of Alabama. We ended up losing that Super Regional, falling short of the Women’s College World Series. We were seeded higher than Alabama, and had SUCH a good team. We had won the Big 12 Conference that year, and had such high hopes of this team in 2005 making it to Oklahoma City. Unfortunately, in the last conference series of the year, our amazing center fielder and lead off hitter, Sharonda McDonald had tore her ACL sliding into home when we were in Columbia playing Missouri. And then a week later, I got hurt. These were 2 major blows to a team, terrible timing for injuries, especially to 2 starters. 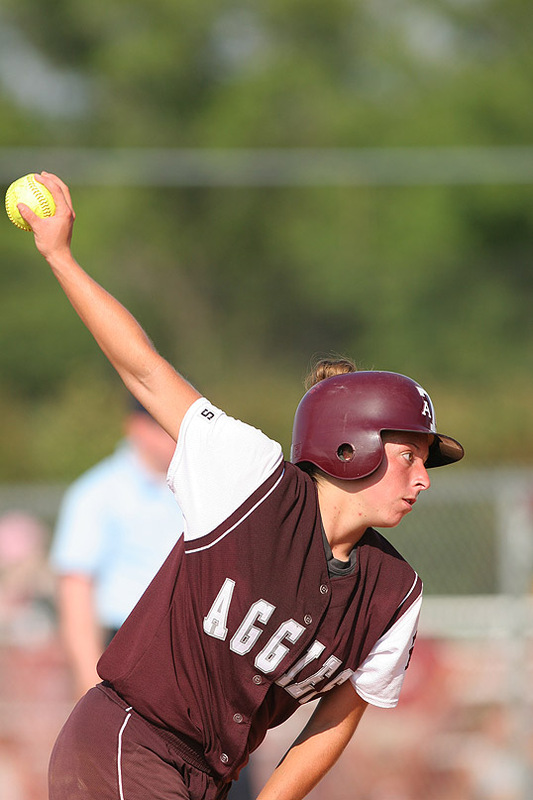 What I did my freshman year to pitch with a helmet on, I would do again. I didn’t know any better. If there was a way that I could play, I would figure it out. If you love the game, you’ll do ANYTHING to be able to compete at the sport you love.